Don't these look pretty? This is the last post featuring treats from my Christmas gift boxes, this time being Florentines. If you have never come across these little gems before, Florentines are crispy cookies containing cornflakes, nuts and glace fruit, with a chocolate back. They are delicious, and I will often buy one to have with coffee (persuading myself that they are more virtuous than cake or a muffin :)). Because we had very damp weather when I made these cookies, my Florentines were crispy for the sum total of one afternoon, after which they became rather chewy, although still delicious (IMHO - LOL). Accordingly, I recommend making these during dry conditions so that you don't face the same problem. I used Karen Martini's recipe for Florentines, which you can find online at Susan's Food.Baby website, or as I did, in Karen's latest book, Cooking at Home (which I bought using a Borders gift voucher that my work colleagues gave me for my birthday - I am a lucky chick). This is the back view of the Florentines after their chocolate back has been painted on - this is 70% cocoa Whittakers dark chocolate, and it tasted superb! If you have never made Florentines before, I recommend Karen's recipe. It is a little fiddly pushing the mixture into a round cookie cutter to give them their trademark round shape (and your hands become very sticky!! ), but the end result is worth it. You can readily substitute other fruits and nuts or leave some out if you don't have the exact combination suggested by Karen. Wishing you all a very happy and peaceful 2009. This week's Tuesday with Dorie recipe was chosen by Anne of Anne Strawberry, and is a Tall and Creamy Cheesecake. This delicious recipe has endless combinations - you can flavour your crust and filling as you please. I chose to make a cherry coconut cheesecake, using Dorie's coconut crust and coconut filling with the addition of a cup of fresh pitted cherries to the filling. This recipe was a breeze - I had no problems with it, and the end result was just devine. I could have easily eaten it all by myself, but the calorie count terrifies me, so I took it to work to share. To see all of the other wonderful variations on this cheesecake, please check out the TWD blogroll. I probably won't be participating in TWD next week, as I will be away from home, but I wish the other TWDers well with what sounds like a delicious choice. Happy New Year to the TWDers, the Daring Bakers and to all my readers!!! 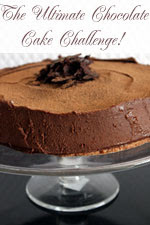 This post features the last Daring Bakers Challenge for this year, which officially means that I have been a Daring Baker for 12 months - and what an exciting year it has been! Now this challenge looked like a very high mountain to climb, as it is comprised of six separate elements (entrements) which had to be assembled into what looked like a very complex frozen dessert. These elements are a dacquoise, a mousse, a creme brulee, a ganache, a feuillete (crisp) and a chocolate glaze. Whew! The other challenging thing was that there were numerous different flavour combinations provided in the recipe, so you had to plan which combinations you wanted to make. I made an almond dacquoise, a mango mousse, a coconut-vanilla creme brulee, a caramel (white chocolate) ganache, a coconut crisp and a white chocolate icing. I even invested in a half pipe pan to make this dessert so that it had the lovely, rounded dome of the traditional version. To top it off, I decorated my completed log with crushed pecan nuts. The outcome was superb - this delicious, frozen treat looked and tasted impressive. I served it to my guests at a Christmas drinks afternoon that I hosted, and they enjoyed it too. Although I was initially terrified of this challenge, I was pleased with the end result, and could hardly believe that I made this. Thanks to Hilda and Marion for choosing such a delicious and creative challenge. It was a fun way to round out my first year as a Daring Baker. You can check out the Yule Logs made by the other Daring Bakers over the course of the next three days by checking out the Daring Bakers blogroll. Hope you all had a wonderful Christmas Day, and that peace and love came your way. I had a lovely day with my family, in fact, one of the best Christmas Days that I can remember. There was virtually no family conflict of any kind (hooray! ), the food prepared by my mother was delicious and plentiful, and our time was spent together in harmony. What more can a girl ask? Now it is Boxing Day, an official public holiday in Oz, and a perfect time to share with you another Christmas box recipe - this time, for chocolate cashew fudge. Personally, I am not a huge fudge fan, but I know that it is popular with many people (given that there are whole stores devoted to selling fudge! ), so it was a "must have" in my gift boxes. I wanted to make fudge the old-fashioned way, without the assistance of condensed milk, so I used a recipe for chocolate fudge from The Australian Womens Weekly's Sweet as my base, and added cashew nuts to it. This recipe was easy to make - as I mentioned in my previous post, I am not an experienced sweet maker, and I had no problems with this. The end result tasted good, although I cannot truthfully say that it is one of my favourite things for the aforesaid reason. There were no complaints about it from the recipients, so I am taking this as a positive :). Grease a 15cm square tin and line with baking paper, leaving sufficient overhang so that you can use it to lift the fudge out of the pan once it's set. Put the white sugar, brown sugar, chocolate, cream and milk in a saucepan and stir over heat on the stovetop until the sugar dissolves, then bring the mixture to the boil without stirring and allow to boil for around 10 minutes or until the mixture reaches 116 degrees Celsius on a candy thermometer. Remove the saucepan from the stovetop, leaving the candy thermometer in the mixture, and place the chopped butter on top of the mixture, but do not stir it in. Allow the mixture to cool on the bench to 40 degrees Celsius (around 20 minutes), then take out the candy thermometer. Add the cashews (or other nuts), if using, then stir the fudge with a wooden spoon for around 10 minutes or until the mixture holds its shape when a small piece is dropped onto a plate. Spread the fudge into the prepared tin, and cover the top of the tin with foil. Allow the fudge to set at room temperature for 3 hours or until the fudge sets. Once the fudge has set completely, lift it out of the tin using the paper overhang, and cut it into squares of the desired size. Wrap as desired, or store in an airtight container. This project took longer to complete than I anticipated (I put together 28 of these boxes), but it was fun to plan and execute, and I was pleased with the end result. I'm not sure that I would do it again, at least on this scale, but it was definitely worth it. I am on holidays at the moment, and I am loving it! I apologise in advance for not being a good blogger over the next couple of weeks. This week I am staying with my mother, who lives interstate, and then we are all going away to a coastal town where I will not have any computer access (although I hope to pre-program some posts to load while I am away). I wish you and your families a very merry Christmas, and a peaceful and happy New Year. With the mad round of Christmas functions well and truly over, I can now share with you some more of the treats that I made for my colleagues and friends to put in their Christmas boxes. Today's post is all about Bill Granger's yummy almond, cherry and white chocolate nougat from Holiday, which also happens to tie in nicely with Yummy Food's hosting of Food in Colours - White. Food in Colours is a monthly event created by Tongue Ticklers. Now, you are probably thinking that, apart from the rice paper on top of my nougat, it is brown. You would be correct - but it is supposed to be a glorious pristine white, hence why I am entering it in this event. I slightly overcooked the syrup used to make the nougat, so while it tasted very good and not the least burnt, it wasn't the wonderful winter white that it is supposed to be. So please dear readers, overlook the not-so-perfect colouration of my nougat, and instead imagine the wonderful sweetness and crispy yet chewy texture of this delightful sweet. I was actually very proud of how this turned out. If you want to develop your biceps without going to the gym, then make plenty of this nougat, because it becomes very thick towards the end of the creation process, making it almost impossible to stir through the almonds, dried cherries and white chocolate chunks, and once it has set, it requires all of your strength to cut it into bite-sized squares. However, it is worth it - I had quite a few pieces of this left over from my Christmas parcels, and they all went down the hatch! Rather than potentially trip you up with my re-hash of the recipe for this nougat, it is available online at the ABC's website here, or in the Sydney Morning Herald here (along with a lovely photo of what it should look like). Although the difficulty says "medium", I am not a sweet maker, and I had no problems with it, other than that I let the syrup cook a teensy bit too long. I can thoroughly recommend it - it is delicious. You have until 31 December to make your own Food in Colour - White entry, and do check out the roundup of inventive wintry white dishes at Yummy Food after that. The penultimate TWD recipe for December is Real Butterscotch Pudding, chosen by Donna of the intriguingly named Spatulas, Corkscrews and Suitcases. I almost skipped this one, as I am currently on holidays at my mother's house, and she does not approve of my using her kitchen. However, I decided to run the gauntlet and make this pudding anyway, as I have a real sweet tooth and I therefore find anything with the word "butterscotch" in the title appealing. I met with all kinds of issues in making this pudding. Apart from some unwanted parental supervision (I am over 30! ), my brother insisted on standing in my work space, and an electrician came to install a safety switch in in the middle of proceedings, between my whisking the eggs and adding the hot liquid to it. Also, there are not six ramekins at my Mum's house, so I poured the pudding into one big dish, hoping for the best. I am not sure if any of these things had a bearing on the outcome, but 5 hours later, my pudding is like thickish custard, but it is definitely not set. It is pourable, and I think that if it doesn't set, it will taste perfect on my plum pudding on Christmas Day - kind of like brandy custard, except with rum (we don't have scotch in the house). Although the result is far from perfect, I'm glad that I gave it a shot, and maybe I'll try it again, as what I have certainly tastes good, even if the consistency is not quite what it should be. To check out how the other TWD bakers went, check out the TWD blogroll here. This week's TWD is hosted by Heather of Randomosity and The Girl, who has selected Dorie's Buttery Jam Cookies. These cookies are easy to make, and although not the prettiest girl at the dance, they taste good. I used apricot jam in mine as suggested by Dorie. If the test of how good these are is how quickly the punters made them disappear, they were delicious. Looks aren't everything after all. Thanks to Heather for hosting this week. You can check out the other TWD members' take on thse cookies at the TWD blogroll. Hi to all, my apologies for being a little late with this post. I had Christmas drinks at my place yesterday afternoon and, well, this post just never happened when it should have. Congratulations to you, and thank you to everyone who was so kind as to drop by and comment on my post. Could the three winners please email me their name and address details to me at gmiddle72 [at] gmail [dot] com so that (when you least expect it!) in the course of the next 365 days, I can send you your prize. And don't forget to Pay It Forward! 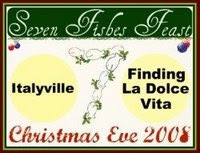 Joe of Italyville and Maryann of Finding La Dolce Vita are hosting a new event, the Seven Fishes Feast. As both Joe and Maryann are of Italian heritage, they are sharing one of their Italian traditions with us through this event. The feast of the seven fishes is an Italian tradition. Every Christmas Eve, "the vigil" is kept with the custom of dining on 7 fish dishes as Italians await the birth of the Saviour at midnight. To participate in this event, Joe and Maryann have asked us to create a fish or shellfish dish and post about it by December 18 - simple. In addition to the joy of participating, there are prizes to be won, so get cooking! As luck would have it, a lovely prawn, saffron and tomato risotto was on my menu, with the recipe featuring on p40 of the December 2008 issue of BBC Australian Good Food. Tomatoes and prawns together is a wonderful flavour combination, and I had some good quality red saffron threads from my blogging friend, Ivy, that I could use. I bought New Zealand prawns and lovely fresh vine-ripened tomatoes from Prahran market. This dish was delicious - slightly spicy, but not so much as to overwhelm the delicate flavour of the prawns. The hardest part about preparing the dish is de-heading and deveining the prawns - never my favourite job. Heat the stock and saffron in a large suacepan; bring to a simmer, then reduce the heat to low, leaving the stock over the heat. Melt the butter in a large frypan, then add the onion and garlic and cook until softened. Add the rice and cook for 1 minute, stirring all the while. Add 1 cup of stock from the simmering saucepan to the rice, and stir it until the stock has been absorbed by the rice. Repeat untl all of the stock has been added and the rice is tender. Add the tomato to the rice, and cook for a further 3 minutes until the tomato is soft. Add the prawns and toss thorugh the rice, cooking until the prawns are heated through (if your prawns were purchased cooked and are therefore cold). If you bought green (uncooked) prawns, you will need to cook them before adding them to the risotto. Divide the risotto evenly between 4 plates and sprinkle with parsley before serving. Thanks to Joe and Maryann for hosting this fun event! LB is an admin assistant who works for the lawyers at the mothership. LB is a lovely lady - bright, funny and a girly girl who loves fashion and pretty things. She is travelling to the US for the very first time (in fact, she will already be there), and will not return to work until mid-January. As part of her grand tour across the US, LB intends to visit a few cupcake bakeshops, because she absolutely adores cupcakes. If you come across a bubbly young Aussie in a cupcake bakeshop near you, it may just be LB. To wish LB well, I made her and her colleagues a batch of cupcakes that I thought she might really like - marshmallow coconut cloud cupcakes from The Crabapple Bakery Cupcake Cookbook by Jennifer Graham. To make these cakes even pinker and sparklier, I decorated them with pink conversation lollies, silver cachous and pink edible glitter. LB loved them - hooray! They were very good, but very sweet, as you can imagine. The recipe called for coconut milk, which I didn't have, so I substituted buttermilk and added coconut essence. Preheat your oven to 170 degrees Celsius and line 2 x 12 hole muffin tins with cupcake papers. Put the coconut in a food processor and process for around 4 minutes to make it very fine. Place the coconut in a bowl with the flour, baking powder and salt, and stir to combine. In another bowl, combine the eggs and egg whites, but do not beat. In the bowl of an electric mixer, cream the butter and sugar until light and fluffy. Add the eggs slowly and beat in until the mixture is light and fluffy. Beat in the vanilla essence. Stir the coconut essence through the buttermilk. With the mixer on low speed, add the flour and milk alternately to the batter in 3 batches, starting and ending with the flour mixture. Divide the batter evenly between the cupcake papers, and bake for approximately 20 minutes. Remove the cakes from the oven and leave to cool completely on a wire rack. In a heatproof bowl, combine all of the ingredients except the flavouring and colouring. Place the bowl over a saucepan of simmering water so that the bowl is not touching the water, and beat the frosting continuously with an electric mixer until it becomes light and fluffy and forms soft peaks. Remove the frosting from the heat and stir through the vanilla and colouring to the desired hue. Whisk the frosting until it forms stiff peaks, and transfer it to a piping bag fitted with a star tip. Pipe the frosting on top of the cupcakes, starting at the outside edge and working into the middle in a circular motion, finishing with a central peak. Decorate as desired. These cupcakes are ever so cute, and very yummy. They would be perfect for a little girl's birthday or a big girls' afternoon tea - and even the boys enjoyed them. Before I go, I wanted to mention that I am one of the lucky winners of Natalia's (Gatti Fili E Farina) "Pay It Forward" competition, where the prize is a homemade treasure by Natalia. The great thing about being a winner is that you have to be willing to do the same. The catch is that you must have a blog and be willing to do the same thing…"
On that note, if you would like to participate, please leave a comment on this post between now and 8am Australian Eastern Standard Summertime on Sunday, 14 December 2008 (which will be sometime on Saturday for most people in the Northern Hemisphere). I will put the name of everyone who comments during that time into a hat, and the first three names drawn (to be announced sometime the same day) will receive a homemade treasure from me over the course of the next 365 days. Have fun! We are getting very close to Christmas now, so our TWD hosts are choosing lots of seasonally-friendly recipes for us to bake. This week's host is Ulrike of Kuchenlatein, who chose Grandma's All-Occasion Sugar Cookies from Dorie Greenspan's Baking - From My Home To Yours to bake. These basic cookies can be flavoured and "dollied up" however you like to make them overtly festive, or left just plain. I chose to sprinkle mine with red, white and green decorating sugar to add a splash of colour while avoiding the commitment of having to ice them at 11pm in the evening, while I left the dough plain. This was another Dorie recipe whereby the finished product tasted great, but the dough was difficult to deal with in reaching the end result because of its softness. I refrigerated my dough for more than 24 hours, but it very quickly softened out of the fridge. I cut the rolled out dough using cookie cutters instead of taking the "slice 'n' bake" option, which I think was a mistake. After the first few cookies, I realised very quickly why Dorie mentioned that she just used a round cookie cutter - the dough is too soft to tolerate fancy shapes well, and when the cookies bake, the dough spreads to such an extent that the shapes become puffed and distorted, ending up reminiscent of the Pillsbury Doughboy. For the last couple of batches, I actually cut out the rounds from the dough using kitchen scissors and left them on the backing paper when baking them. Despite my issues with the dough's handling ability, the end result was delicious - and I am not really a cookie fan. The cookies were crispy and light (excepting the puffy, fancy-shaped ones, which were thicker and therefore softer), and the decorating sugar gave them extra "crunch" as well as colour. Thanks to Ulrike for hosting this week's Tuesday with Dorie - you can check out how everyone else personalised their cookies by going to the TWD blogroll. Christmas is nearly here - I can't believe how quickly the year has flown! I am in the midst of a Christmas baking frenzy, as I am still working on my Christmas boxes, which have to be finished by next weekend. In the meantime, I am juggling that with the usual round of Christmas functions and doing the things that I enjoy doing - oh yeah, and going to work. I have two weeks off very soon, when I will join my family for Christmas - can't wait! I have posted a lot of sweet things lately, and there will be more (I went through around 2kg of sugar today). However, just to mix things up a bit, I thought I'd post about one of the savoury dishes that I have made recently, which has slightly more nutritional value and is a little healthier than my cakes. This dish is a lamb curry, based on the Sri Lankan pork curry recipe in the November 2008 edition of BBC Australian Good Food magazine. The recipes in this magazine are good because they tell you how evil (or not!) they are at the end of the recipe, and this one is relatively low in fat and calories - I don't think the substitution of lamb would have changed this much. As always, I changed the recipe to match the ingredients that I had rather than going out and buying more. Heat the oil in a frypan, then brown the meat in batchesand set aside. Cook the onion in the frypan for 5 minutes until soft, then add back the meat with the garlic and curry powder. Cook for around a minute, then stir in the stock and the tomatoes. Cover the frypan, reuce the heat and simmer for 1 1/2 hours. Add the zucchini, and cook the curry for a further ten minutes. Stir through the chooped coriander and season the curry with salt and pepper to taste. Serve on a bed of rice. My two "neighbours" at my secondment job, Aaron and Andrew, decided to test my baking skills by asking me to make Red Bull cupcakes. Given that they both generally drink "V", containing guarana, I was surprised at this shift in brand allegiance. I was also a little worried by this request, as I didn't want to be responsible for people getting a little too excited on all that caffeine. However, never being one to shy away from a challenge, I agreed to take on their request. This is how Red Bull cupcakes were born. Now I know that Coca Cola and Red Bull are not the same, but I believed that I could use Nigella's recipe for Coca Cola Cupcakes from How to Be a Domestic Goddess as my base cake recipe, and simply substitute Red Bull for Coca Cola. And lo, an idea was born. Weirdly enough, these actually worked. The cakes smelt horribly like Red Bull (not one of my favourite smells! ), and tasted like caramel cakes. My friend Aphrodite, who has never tasted Red Bull in her life before, thought that these were caramel cupcakes. Although I chose not to decorate them in a fancy way (I actually felt very average when I made these, as I was still recovering from my head cold, so I did as little as possible), this was actually a good thing, as these cakes were made for the boys. And the boys loved them!!! It certainly is not something that I would have chosen off my own bat to make, but I am glad that the recipients of the cupcakes were pleased with the results. The boys had wanted me to add a syrup made from guarana powder to the cakes as well, but you can't buy this from an Australian health food shop - you have to buy guarana powder online, and there was no time for that. Preheat your oven to 180 degrees Celsius. Line a 12 hole muffin tray with cupcake liners. Sift the flour, sugar, baking soda and salt together into a bowl and set aside. Beat the egg, buttermilk and vanilla together in a separate bowl. Place the butter, cocoa and Red Bull into a saucepan, and place the saucepan over a low heat, stirring, to melt the butter. Pour the butter into the dry ingredients and combine, then mix in the egg mixture. Divide the cupcake batter evenly between the muffin pans, and bake in the preheated oven for around 20 minutes or until the cakes are cooked through. Tip the cooked cakes out of the muffin pan immediately on removing them from the oven, and leave them to cool on a wire rack. Place the butter, Red Bull and cocoa in a small saucepan, and stir the contents over a low heat until the butter has melted. Take the butter mixture off the stove and stir through the vanilla. Beat in the icing sugar, one spoon at a time, until you have a spreadable but runny icing. Spoon the icing on top of the cupcakes while they are still warm, then leave them to set. Enjoy with a Red Bull! This week, Tuesday with Dorie is hosted by noskos of Living the Life, who has chosen Dorie's Linzer Sables for us to bake. Linzer sables are named after the town of Linz in Austria, and are a nutty, spicy cookie sandwiched with jam (traditionally blackcurrant jam). These cookies are very cute, and I have often admired them. I ground my own almonds to make the almond meal for these cookies (admittedly because I forgot to buy almond meal rather than an earnest desire to make everything from scratch), and I used bought fig and ginger jam to sandwich the cookies together. I had a dickens of a time with the dough, which goes unmanagably soft very quickly out of the refrigerator. At times, because I couldn't lift the shapes I had cut from the dough, I cut them out with scissors, paper and all, and placed them on the baking sheet. Because the dough was so difficult to handle, I had resolved never to make them again. Thanks to noskos for hosting TWD this week, and you can see all of the other wonderful versions of these simply delicious cookies by checking out the TWD blogroll. I love old-fashioned cakes, biscuits and slices. They remind me of growing up, being with Mum in the kitchen, visits from relatives and happiness. One of the many baked treats in Mum's repertoire when I was growing up was raspberry coconut slice, which she made effortlessly from a recipe in her head (which I do not have). This slice consisted of a buttery, cakey base, topped with jam and finally a fluffy coconut meringue. I was therefore delighted when I received my copy of Ladies, A Plate by Alexa Johnston to see that raspberry coconut slice was a treat in New Zealand too - and that I now had a recipe to make it. Alexa's version goes by the very feminine name of Louise Cake, but is exactly the same as the more prosaicly named raspberry coconut slice. Preheat your oven to 180 degrees Celsius. Grease a 30cm x 21cm slice tin. Cream the butter and the sugar, then beat in the egg yolks. Add the lemon juice, then stir in the sifted flour and baking powder to make a soft dough. Press the dough into the base of the tin, then spread with the jam. Beat the egg whites to the stiff peak stage, then fold through the sugar and coconut. Spread the coconut over the top of the jam, being careful not to mix the two. Sprinkle the top of the slice with a little extra coconut. Place the slice in the oven and bake for around 25 minutes or until the top of the slice turns golden brown. Remove the slice from the oven and cut it into squares while still warm. This is a perfect tea time treat that looks and tastes lovely, yet is very easy to make.